iStock is one of the top stock photo agencies in the industry, and the pioneer in the microstock model –selling royalty free photos online at low prices with minimum payment requirement–. They're backed by Getty Images, and they're well-known for their high curation level and extensive catalog that includes a huge collection of exclusive images. iStockphoto.com (now iStock by Getty Images – read all about the name and ownership change here) is one of the top stock photography agencies, and nothing less than the pioneer in the Microstock image industry, and one of the top 5 in our Best Stock Photo Sites List. Besides it's impeccable reputation, iStock has an impressively large selection of stock photos, video, illustrations, vectors and audio files that are highly curated with the highest quality standards, and they add value with a collection of exclusive content. 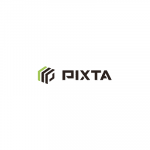 With the amount of experience and largest stock photo library of exclusive images, this stock agency is certainly worth considering if you are looking for royalty-free images that are both affordable and high quality. Millions of high value, exclusive images you won’t find anywhere else – including photos, illustrations, vectors, audio and video. Subscription plans with monthly and annual options – enabling rollover of unused downloads. Advanced image search: keywords and search by image, with advanced filter options like file type, contributor, collection, size, shape, complexity, details, additional filters, colour, file number and lightbox. Accepts PayPal, Visa, American Express and MasterCard. They also accept US money orders or checks from US or Canadian banks. Free weekly photos, illustrations, video clips and audio clips. Signature artist of the month – follows a different contributing artist each month and gives the story of their art and what it means to them. Their FAQ is thorough for everyone, including buyers, sellers, individual purchasers and corporate accounts. iStockphoto.com was founded in April 2000, with the initial attempt at launching into stock photo around 1999.
iStock is owned by the biggest stock photography agency in the world, Getty Images. iStockphoto has their corporate headquarters in Alberta, Canada. Impressed already? If you want to discover iStock's amazing library, sign up for free at iStock right here! And to save more in your photos, don't forget to redeem our exclusive iStock Promo Code! iStock was the first “microstock” agency, inaugurating the business model where companies offered stock photos on an online searchable library, under Royalty Free license and with a micropayment (a minimum payment) requirement. They were soon followed by several other companies, and today they have many competitors. But iStock found the way to remain distinctive: adding value to their offer via their unique image curation. Like this, iStock has an image for every buyer need. If you want budget photos that can be used in professional designs, Essentials is for you. And if you want more artistic, first-class imagery and are willing to spend a little more to get them, you will find what you're looking for in the Signature collection. Learn more about iStock's collections here. Originally iStock only sold images via a minimum purchase requirement, and then in bulks. But later on, they added a very popular buying option: stock photo subscriptions. Right now they combine a credits system for on demand buying and subscription plans that offer you the lowest prices. Their credit system is very simple. 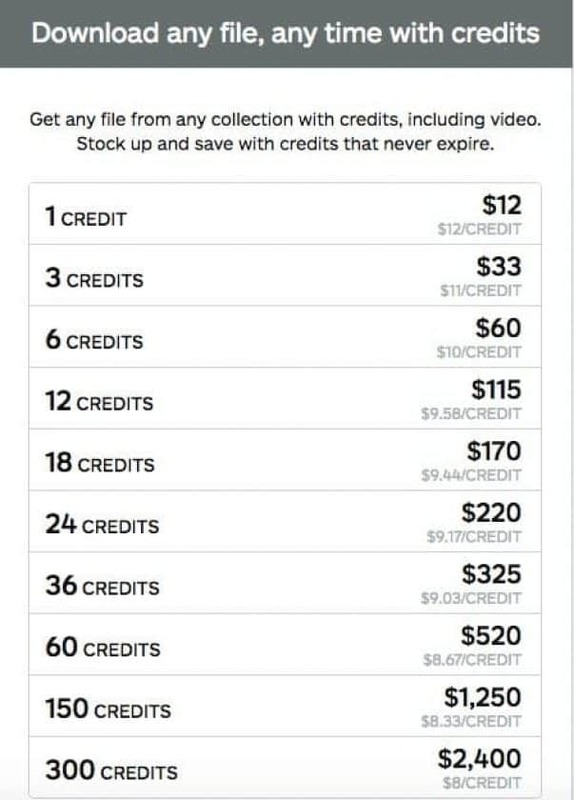 They price all their files in credits, and they sell you credit packs that you pay upfront, and later use to download the images you want. The bigger the credit pack, the less each individual credit cost and therefore the cheaper each photo will be. They have packs from 3 and up to 300 credits, making each credit cost from $12 and as low as $8 each. One of the best things about iStock is they don't price their photos according to resolution or size, but rather according to collection. Want to buy iStock photos with credits? You can now get them at a cut price with our special iStock Promo Code with 15% Off in all Credit purchases! Another great, more recently added feature is the quick checkout: if you only want to buy one image, you can simply hit the download button on that image page and you're taken directly to the payment page, skipping the step of buying the necessary credit pack. The price is the same, but you do it much quicker! As for subscriptions, iStock offers a lot of variety for all kinds of budgets. All plans come with monthly download limits, but you can hire them monthly or annually. Plus, they have two alternatives: subscriptions for Essentials downloads only, which are cheaper, or plans that give you access to both Signature and Essentials images. Monthly plans have small volume options, starting at just 10 and up to 250 images a month, price ranging between $40 and $199 for Essentials plans, and from $100 to $399 for full collection including Signature. Annual plans give you an even better price: Essentials fall between $29 and $159, and Signature + Essentials is from $70 to $319. This means up to hundreds of photos every month, costing as little as $0.21 each! See iStock full Plans and Pricing here. 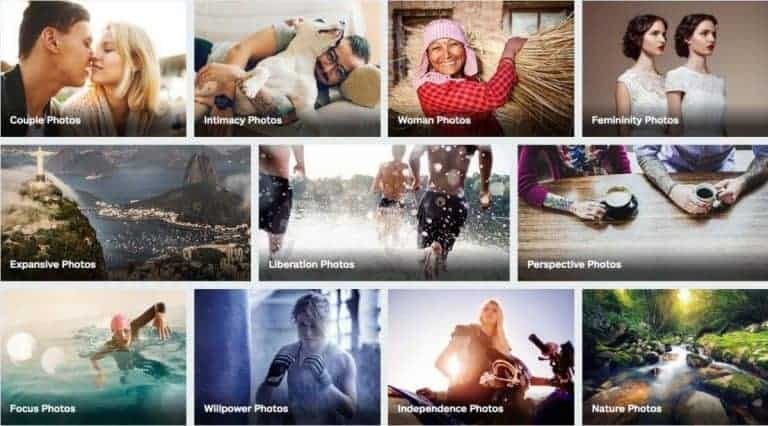 It's worth to note that iStock's Essentials collection is par to many of other stock photo agency's catalogues, and their subscription plans are much cheaper. While at most other image banks a 750 downloads plan costs $200 – $250 per month, Essentials plan is only $159! Ready to get an iStock subscription? Then use our great iStock Promo Code with 15% Off in all Subscription Plans! iStock adds user functionality to make their offer a very convenient one for buyers. Mainly, they take care of making all their photos easy to find. For this, they have a fantastic built-in, keyword-driven search tool. Using their own controlled vocabulary, they deliver results very fast based on keywords you can enter in a dedicated search field on their site. This field is complete with an auto-suggest feature that throws popular searches matching what you're typing. And you can further filter results using advanced functions. From sorting them according to various criteria (most relevant, popularity, most recent), to narrowing matches according to the collection, license type, people (or the absence of), composition, even colour. 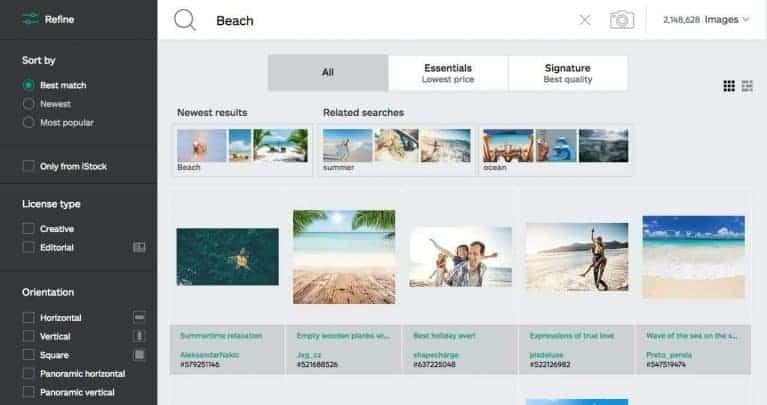 But by far their best feature is the “search by image”, that lets you use any image of your choice as a search parameter, using image recognition technology to find similar content in their library. All you have to do is upload the photo you want to find similars for, and the system takes care of the rest. Keywords and advanced filters will apply to these results too, for extra precision. All images in iStock are available under a Standard Royalty Free license which grants perpetual use in multiple projects, without any geographic limitations, and for commercial, editorial or personal purposes. It's very flexible and affordable: you pay once and you get to use the photo forever, always within the accepted terms. All images come with Standard License by default, and prices expressed in their website correspond to this option. There are very few restrictions to an image used with this license. Mainly, the print run is limited to 500,000 copies, and you're not allowed to use the photo in products for resale, be them physical or digital. They have Extended Licenses available, at a higher price point of 18 credits (added to regular image price), which eliminate some of the main restrictions in Standard RF license, but each extended right is sold as a separate license, letting you add as many as you wish: unlimited print run, use in physical products for resale, multi-seat (allowing more than one person to work with the photos), use in digital templates for resale, and greater legal guarantee coverage. 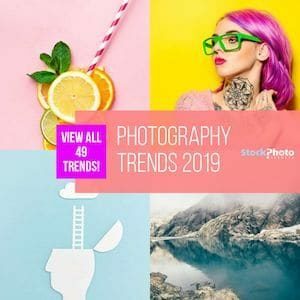 iStock (former iStockphoto) is not only a pioneer company but also one of the leaders in the stock photo industry since the beginning, and there are good reasons for this. For one, they have been around for 17 years now, and this history adds to their reputation to give you the tranquillity of knowing you're dealing with experienced professionals and acquiring a serious and reliable service. Equally important, they offer many things that other image banks do not have. Their exclusive collection being the main one, followed by their high standards curation. With iStock you are certain to get the best imagery in the industry, as they offer only high quality, carefully reviewed content. And you can buy exclusive photos that are more unique and will increase the value in your designs. Plus, their prices are very affordable, their buying options are convenient, and their licensing terms are flexible. iStock has a lot of positives for customers, which makes many buyers choose them when they want to get stock photos for their projects. They have a loyal base of clients and of contributor photographers. And after reading this, you may be one of them too! Do you want to get iStock photos right now? Then sign for free at iStock! 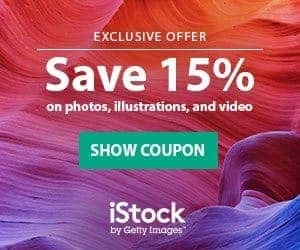 And to buy images at the best, lowest price possible, don't miss our exclusive iStock Promo Codes for up to 15% off in your purchase! September 2014 istockphoto changed the credit system. Before the 5:1 conversion my creditsBalance was 17. After the 5:1 conversion i’ve got 4 credits. I’m only used 2 credit images in the old system, so for 17 credits i can download 8 pictures. In the new system i can only download 4 images for those 4 credits. Conclusion: istockphoto ripped me of for 50% !!! Buyer beware! While I have always loved the selection of quality Stock Photography, iStock has gotten SO much worse every year Getty Images has owned it. I was contacted by an iStock rep who “sold me” on going with the monthly membership plan. He explained that with the number of images we were downloading, we could save money by going with this plan and even be able download 3 times as many images each month as we already were. He asked me how many Users I would need, and I said “just one” since we really only had 1 main designer. All went well for several months until we get a call out of the blue stating that we were in violation of the legal terms of our agreement. It appears that if you sign up for only one user account, only one person, on one computer from one location can download any images. (They track your downloads by IP address.) If someone else within your company tries to help them out and download any images for them, it violates the terms and they have the right to sue you for well over $100 per image… for every image you have ever downloaded under the agreement… totaling well over $20,000.00. No warning… just here’s what you are liable for by violating the terms. (note…there IS a small paragraph deep within their terms and conditions documentation on their website that states one user means “one seat”) This was never explained to me by the rep. I wonder how many people they rope in this way? This isn’t the first issue we have had with iStock. My recommendation… do your research and find another stock imagery company. I know we will be! Running into this same nightmare. Got talked up into this incredibly ludicrous plan. If you’re at an agency paying for a certain number of downloads, what does it matter who actually downloads it? I’m in Australia, and by Australian law pricing must not be misleading or deceptive, it must show all included taxes and charges. 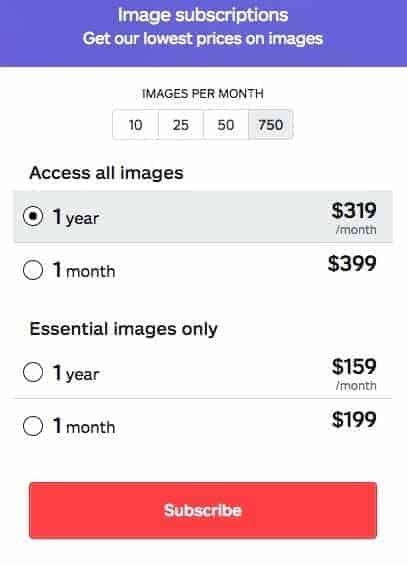 iStock advertised that a particular subscription would cost $230 AUD. I spent 3 weeks choosing images. When I went to buy the subscription they charged an additional $23 in tax, and then I also found on… my credit card over $5 in foreign exchange conversion fees. Unfortunately I needed to continue with the purchase as I had already committed time to finding the images I needed. I have written to iStock twice to get them to refund the additional money, I have also spoken to them several times and they are not interested. The Australian Competition and Consumer Commission agree that iStock is in breach of Australian law and I am currently taking up the matter with the Office of Fair Trading. I suggest you don’t deal with iStock as there are plenty of honest businesses out there you can work with. Buy Images for Commercial Use or Where to Get Images Licensed to Print on T-Shirts?